All the barricades built by anti-government protesters in central Kyiv will be lit up by back-up generators in case there is another power outage, the Maidan's commander, Batkivschyna MP Arsen Avakov, has said. "Today we have taken additional measures to ensure the barricades are lit up by back-up generators if we lose power again. It's a very important step," he said at a briefing in Kyiv on Wednesday. 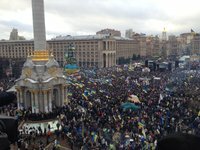 He said that recently the Maidan had experienced regular power cuts. In that regard, oppositions MPs have had five meetings with the city authorities and electricity suppliers. However, there is no certainty that this will not happen again, Avakov said. Avakov said that during the New Year and Christmas holidays there had been no serious accidents on the Maidan. There were several incidents caused by the government, he said. In particular, Avakov mentioned several attempted provocations on the Maidan. As regards the operation of utility service providers, there have been no difficulties with taking rubbish out of the Maidan and taking wood into the Maidan.